The Travel Charger comes with rechargeable batteries and is the only portal charger you can replace the batteries. It conveniently charges 5V devices such as Cell Phones, iPad, PDA, GPS, MP3/MP4 Players, Portable Gaming Devices, Flashlights, etc. 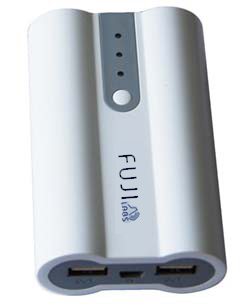 Two devices can be simultaneously charged with one or two batteries inserted in the charger. With the built in Smart Management technology, the Travel Charger is able to function and detect each capacity of the batteries in order to provide optimal charging. It can help recover deeply discharged rechargeable batteries. Using SeiKo patented Li-Battery protection IC, the rechargeable batteries are monitored to protect from overcharge, over discharge and over current.